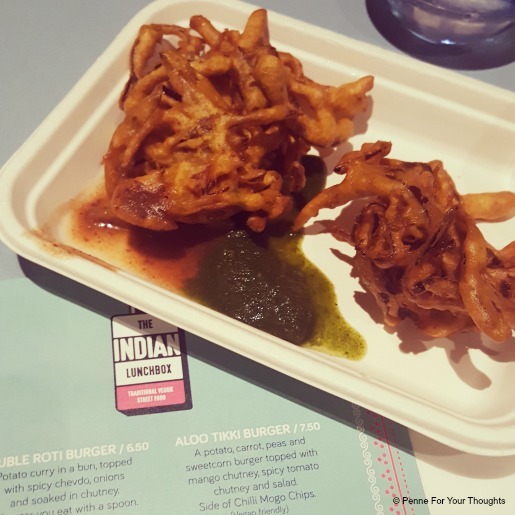 Streetfood is something that is becoming more popular, especially in Birmingham with the likes of Digbeth Dining Club and Brum Yum Yum making it more accessible to the masses. 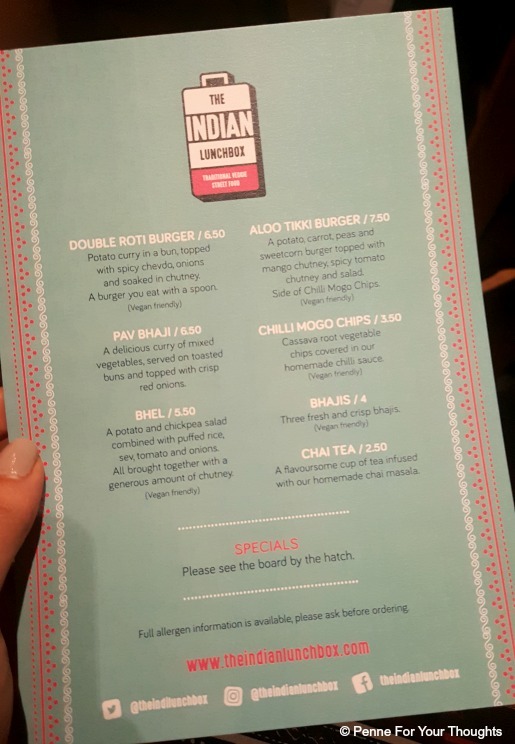 When I was invited to come and try The Indian Lunchbox who are based at 1000 Trades in the heart of the Jewellery Quarter last night I couldn’t say no! They are based there for one week only, so if you’re interested in trying it out (and I strongly recommend that you do) then head down their quick! 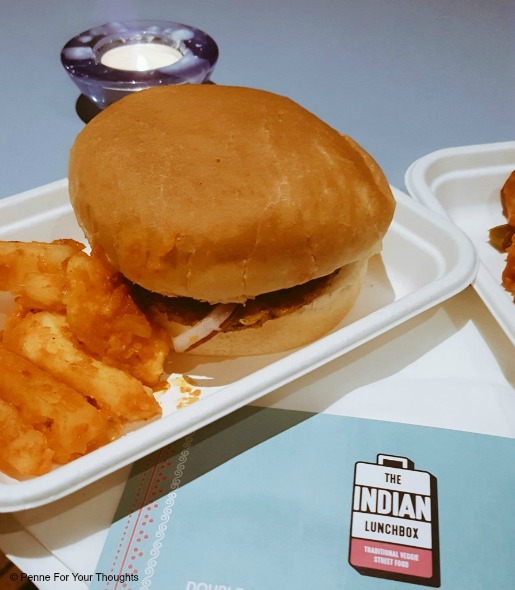 The Indian Lunchbox is a purely vegetarian Indian streetfood pop up, with lots of their dishes being vegan friendly too. The menu looked so enticing, I couldn’t wait to try it all! To start with I went for the Aloo Tikki Burger with came with a side of Mogo Chips. Mogo chips are made from a root vegetable, popular in Africa & India, called cassava. It’s a hard texture and taste to describe, but I definitely enjoyed it. They aren’t like normal potato chips, but covered in chili and fried they were delicious and moreish. The Aloo Tikki Burger was also really good. It wasn’t too spicy but definitely had a kick to it and was wonderfully fragrant. I couldn’t resist going for the daily special they had on of Chilli Paneer. I absolutely LOVE paneer and often find myself enjoying saag paneer from my local curry house. I am so glad I went for it. It was amazing! 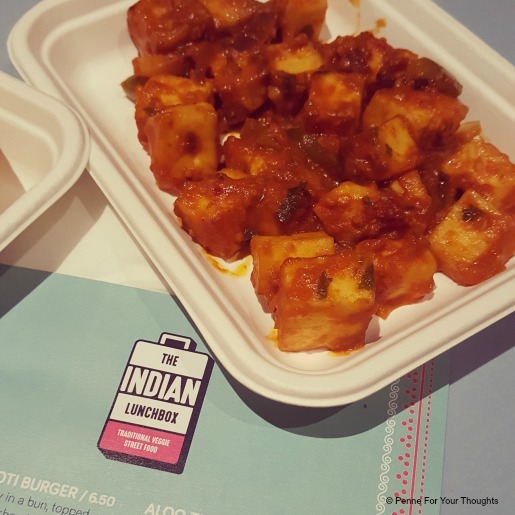 The paneer was perfect, and not too rubbery in texture which sometimes it can be and the chilli sauce was like a sweet chilli, I couldn’t stop eating it. Finally I shared some Bhajis with Nutella Tasha. We both agreed they were very good. I would even say that they were one of the best I have had in a very long time. Made with red onions, rather than the normal white, they were slightly sweeter and served with the chilli sauce and a mint chutney it was a taste explosion in the mouth. 1000 Trades as a venue is really nice. A chilled atmosphere, perfect for a drink after work or a catch up with friends. They have a wide range of drinks available and often have guest brewery’s and special drinks available, they are constantly holding events and hosting different pop up food vendors so I will definitely be back to try more! You can find out more about what’s on by visiting their website. Interested in The Indian Kitchen? 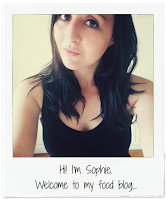 Follow them on Facebook, Twitter or Instagram to find out more about them and where they are! Disclosure: My food from The Indian Kitchen was complimentary, however all opinions are my own and I was not forced to write a positive review.